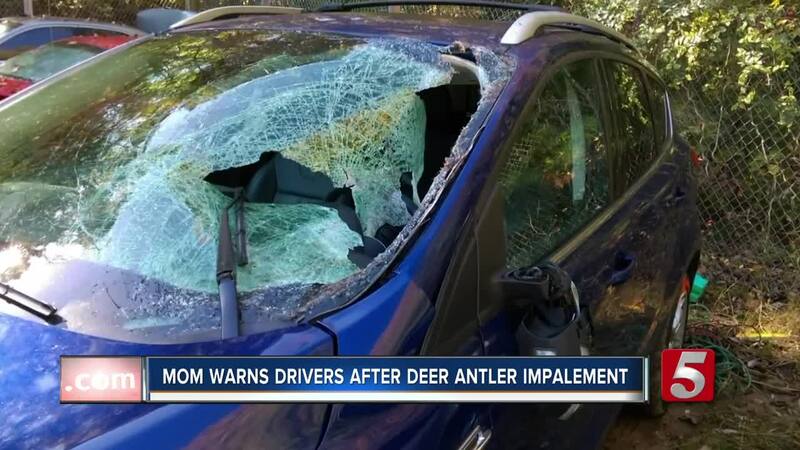 A Dickson County mom who was impaled by a deer's antler wants to warn drivers about deer rutting season. On October 25th, 2017 Beth Street was driving home from work on Interstate 40 when the accident happened. Street said, "I saw a deer running down the side of the interstate, and then he all of a sudden turned into traffic, another car hit it, he sent that deer flying through the air, and it flew straight into my windshield. The antler impaled me as I was sitting there and all I could think was 'keep control of the car.'" The force sent the deer back onto the interstate. She managed to drive her car over to the shoulder and call 911. The driver who hit the deer, and a Good Samaritan from Perry County, stopped to help. Street said, "It was nice to have my guardian angels who helped me out that day, because if not, things could have been worse." A little over a year later, she wants to thank the man from Perry County because she never got his name. She's grateful for Tennessee Highway Patrol Trooper Russell Bernard who applied pressure to her damaged artery. Street said, "He did a great job of being there to help with the wound." It's a miracle Beth survived after being impaled in her chest. Now, she lives life to the fullest. Street said, "Because life is so precious and I was so afraid I was not going to be there for my son and so I just enjoy every moment I have with him." She hopes through sharing her story, other drivers will be aware. Street said, "Please pay attention to your surroundings because you never know where the deer are going to come from, most of the time you just think back country roads or something, but this was on the interstate." Beth had surgery to repair the damaged artery, and she is going to therapy to regain full feeling in her arm.